Whenever we write about the likes of Key Lime Lizard, we always emphasize that these are adware programs. However, users seldom understand the implications that come with having an adware application on their PCs. Most of the time, adware is a legitimate alternative for customers who do not want to pay for the software. However, it is very unlikely that you would like to have something like Key Lime Lizard on your computer. It is obvious that you should remove Key Lime Lizard if you want to keep your computer safe and clean. Adware programs support commercial advertisements because they are usually free of charge. It means that Key Lime Lizard comes free, but it needs to support itself, so it earns money by displaying third-party commercial advertisements. Some users think that that is an illegal activity because they do not remember when or how Key Lime Lizard entered their systems. Actually, Key Lime Lizard always comes bundled with freeware, because keylimelizard.net does not provide us with a direct download link. As a result, users may install Key Lime Lizard unwittingly together with other freeware applications, especially if they do not pay attention to setup steps on the installation wizard. Technically, there is nothing new about Key Lime Lizard. This application is part of the SuperWeb adware family, so we know exactly what to expect of it. The program is very similar to Lampy Lighty, Box Rock Platamoose, and a host of other programs that have been released over the past year. 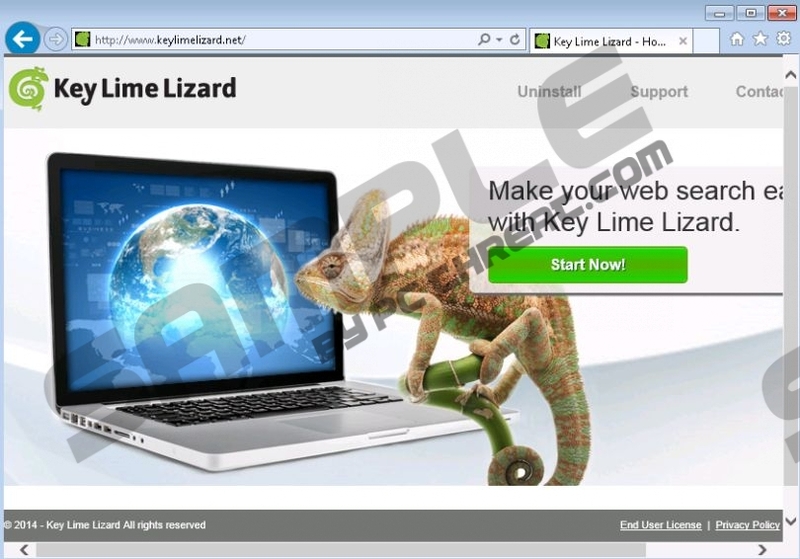 Just like its predecessors, Key Lime Lizard functions like a browser extension, as it is compatible with Mozilla Firefox, Google Chrome, and Internet Explorer. Once the application gets installed on your computer, it starts collecting data on what websites you visit and what you search for online. This might be the reason why your browser performs more slowly than usual. Adware programs often disrupt the web browsing experience. What is more, Key Lime Lizard ads may display content related to your most recent searches, but you should know better than to click them. The problem is that Key Lime Lizard does not check whether the ad content is safe or not. It relies on third-party advertising networks for the ad content, so it cannot be held responsible if you click the ad and then get redirected to a dangerous website. The best way to avoid any potential computer security problems is to remove Key Lime Lizard and other similar applications immediately. If you have no idea what other unwanted apps are installed on your PC, scan the system with a licensed antispyware tool, and then acquire a legitimate computer security application to terminate all the unwanted and potentially dangerous programs automatically. Select Uninstall a program and remove Key Lime Lizard. Open Uninstall a program and remove Key Lime Lizard. Go to Add or remove programs and uninstall Key Lime Lizard. Quick & tested solution for Key Lime Lizard removal.